With an ultra-slim design and superior impact protection, Presidio™ CLEAR + GLITTER is a premium clear glitter iPhone 7 Plus case unlike any other. Presidio CLEAR + GLITTER has a hard exterior layer that disperses force and an interior layer of IMPACTIUM™ CLEAR that absorbs and disperses shock away from your device. - 8-Foot Drop Tested. To ensure that Presidio™ CLEAR + GLITTER offers the ultimate protection for your iPhone 7, it has been dropped from a height of 8 feet multiple times by a third-party laboratory. - IMPACTIUM™ CLEAR. IMPACTIUM CLEAR is a dynamic shock-absorbing material that absorbs and disperses force away from your iPhone 7. - Patented raised-bezel screen protection. 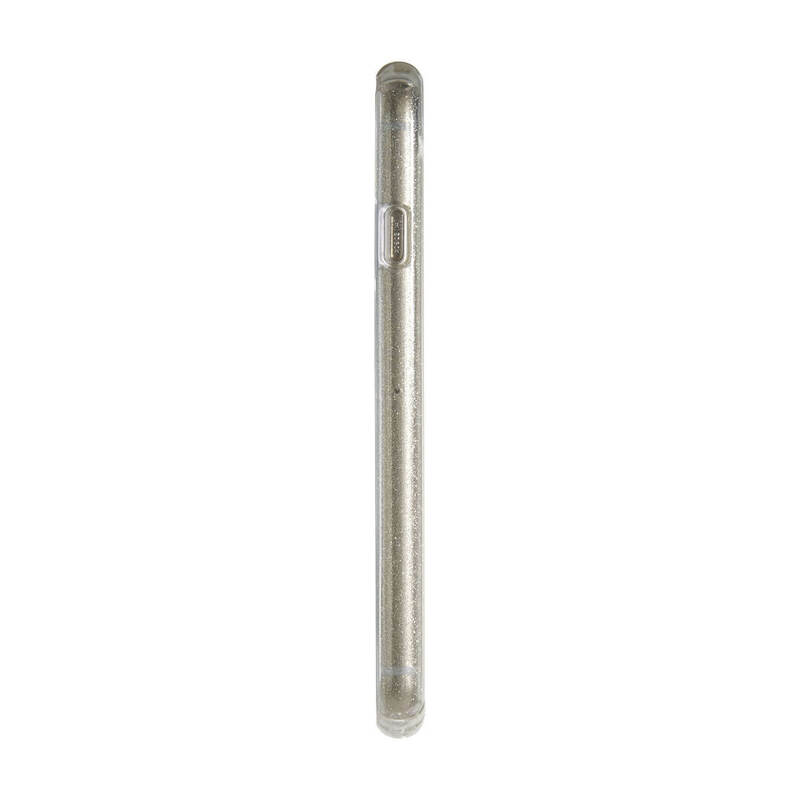 IMPACTIUM CLEAR raised bezel guards screen from direct drops onto phone face and prevents damage when lying flat. - Responsive button protection. IMPACTIUM CLEAR protects volume and power buttons while maintaining true button responsiveness. - Perimeter port and camera protection. IMPACTIUM CLEAR protects ports, microphone, and speakers from drops without compromising acoustics or interfering with port accessibility, camera lenses or the camera flash. - Dual-layer design. 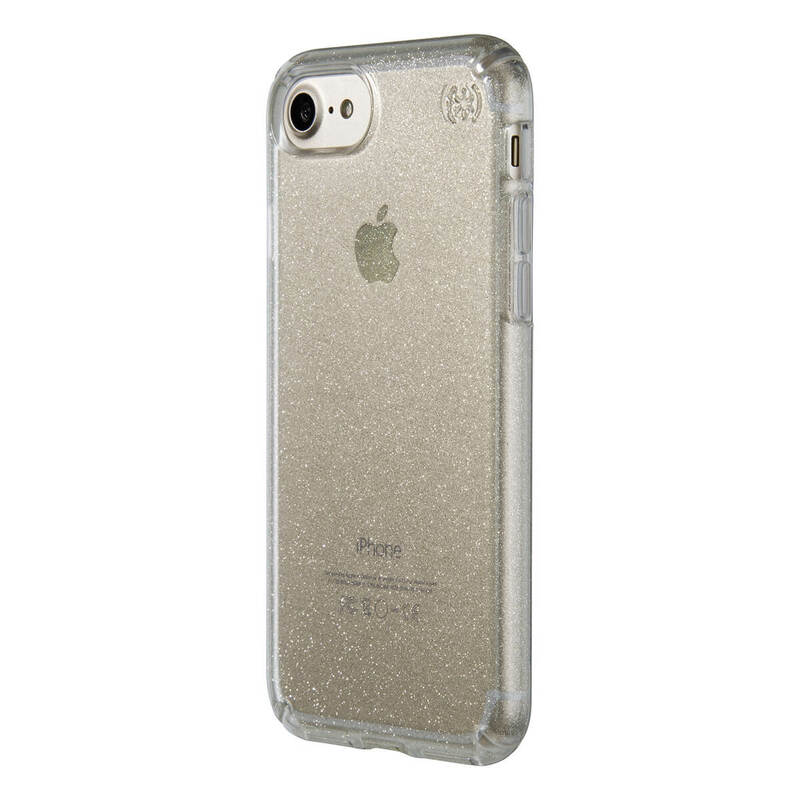 Presidio CLEAR + GLITTER features a dual-layer construction for robust protection. - Slimmest case yet. We’ve created the slimmest dual-layer case Speck has ever made, without sacrificing protection. - Precision-engineered fit. 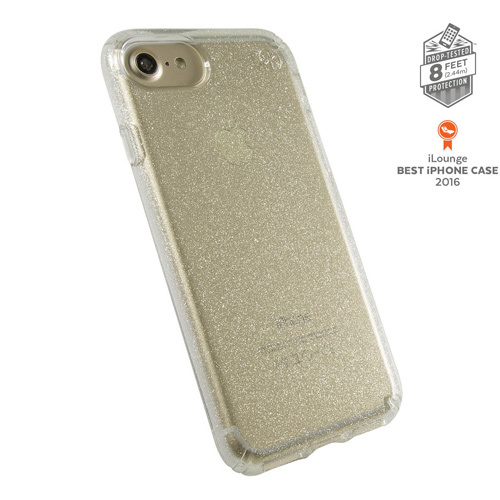 Presidio CLEAR + GLITTER is precision-engineered to fit your iPhone 7 Plus perfectly. - Embedded glitter crystals. 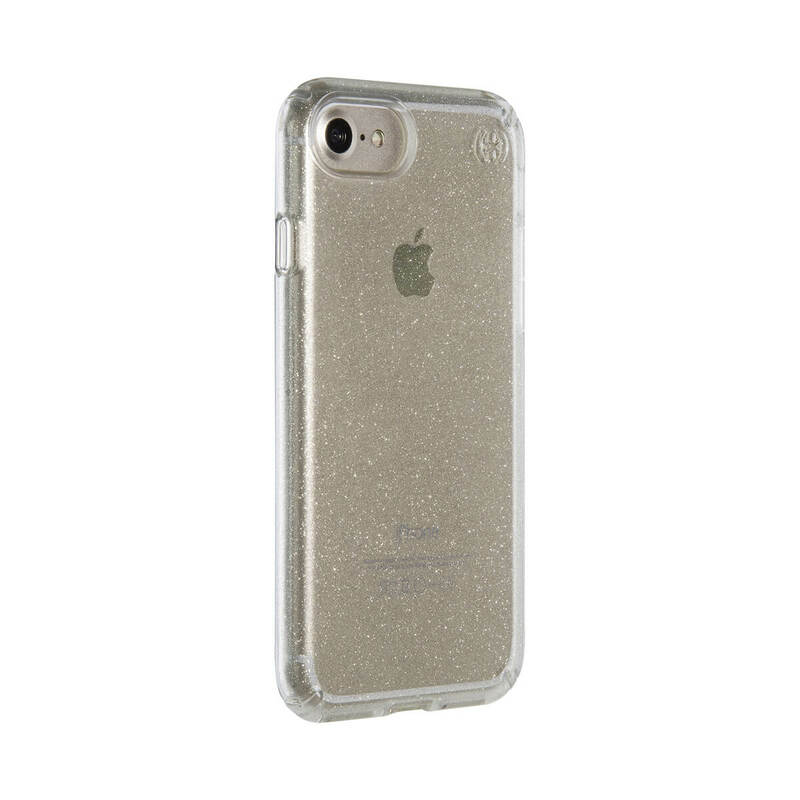 Shimmering glitter crystals embedded in the case’s hard outer layer won’t scratch or flake off. - Scratch-resistant. 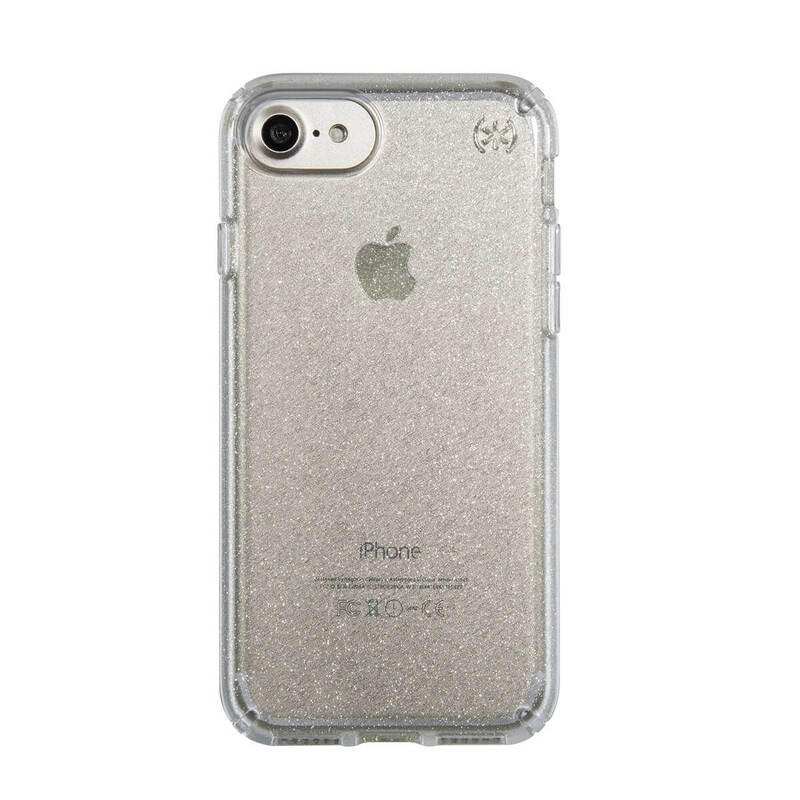 Special clear coating on the exterior of the case resists scratches. - Resists UV Yellowing. Presidio CLEAR + GLITTER’s materials resist turning yellow when exposed to UV light from the sun. - Lab-tested durability. All Speck cases are independently lab tested for multiple real-life situations to ensure your device is always protected. We test to protect against extreme drops, extreme temperatures, chemicals, antenna interference, cracks and abrasions, device bending, and more.